There is a lot that goes into a theme cake. For some, it’s a living…for others it’s a labor of love! 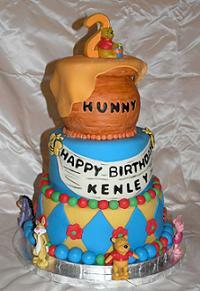 This Winnie the Pooh cake was for a beautiful little girl named Kenley. Her mom wanted something special to celebrate her 2nd birthday and decided on a Winnie the Pooh theme cake unique! Our birthday cake design shows a step-by-step process of making this Winnie the Pooh cake from start to finish. To watch this cake being made visit Piece-A-Cake.Com. This is absolutely gorgeous! You have patience and talent!